We will start with the Calcutta Auction of the Spotlight Western Pleasure 3 and 4 year old class to be held on May 10th morning session in Reeves Arena. All horses that reach $1,000 will go forward to the live auction Thursday evening. 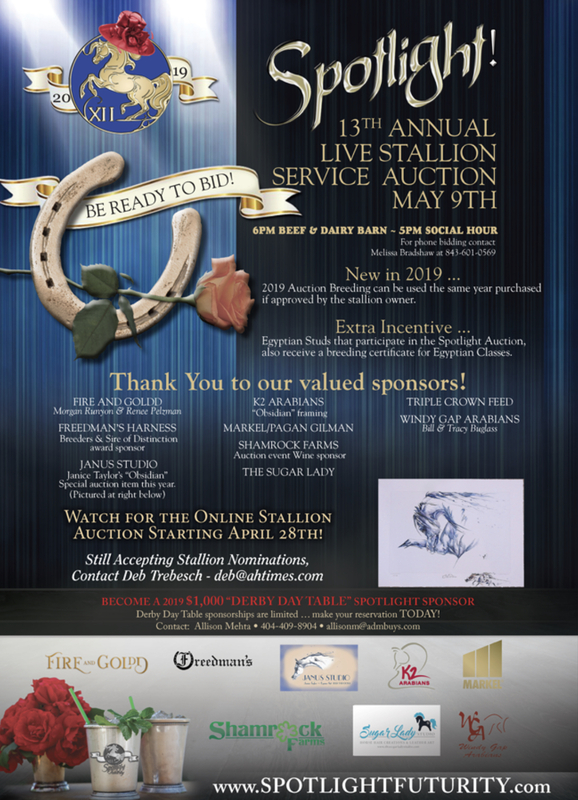 The online auction will begin April 28 through May 8…any stallion that does not reach the $1,000 bid for the live auction, will continue on with the online auction until May 19th for their winning bidders. We still have a limited number of Derby Tables, please contact Allison Mehta 404-409-8904 for further information. A HUGE THANK YOU TO OUR 2019 SPOTLIGHT SPONSORS! Janus Studio~the Obsidian painting donation, will be auction at the live auction(approx 31″x 25″). Janice Taylor has also donated a beautiful painting for Asa Oliver Clagg, He is a 22 month old baby that has been diagnosed with Type 1 Juvenile Diabetes. His parents are raising money for a Service dog to help with detecting his sugar levels. This painting will be Auctioned at the live event. The Sugar Lady~has donated 3 $100 gift certificates that will go to the 3 highest winning bidders in the auction. Markel Insurace~Pagan Gilman is once again supporting Spotlight Futurity with a donation for the May 9th event. Freedman’s Saddlery~ is once again provinding leather halters and leashes for the Spotlight Sire and Breeder of Distinction. Shamrock Farms~is sponsoring our wine for the Derby Table Sponsorships.